The Lac du Flambeau Fish Hatchery was established in 1936. It is located on Pokegema Lake on Highway 47. The emphasis is on raising walleye and musky to stock in reservation lakes that are open for public fishing. Both lake and well water is used to control temperatures for year round production. Fish eggs are harvested from local lakes and hatched in incubators. Some of the fry hatched are put back into area lakes and some are raised to fingerling size and then released. The fish culture program raises all fish necessary for stocking reservation waters. 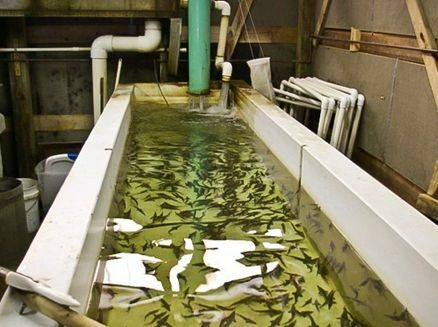 Since 1960 the hatchery has raised nearly 600 million walleye fry, three million walleye fingerlings, two and a half million muskellunge fry and just over one hundred and twenty-five thousand muskellunge fingerlings. The original structure was recently replaced with a new state-of-the-art facility that doubles fish production.